I was recently trying to think of a new variation of the classic chicken salad that I hadn’t yet posted on here. 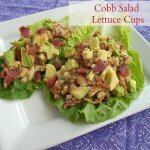 I have several chicken and tuna salads on the blog because I love making them during the summer months. Coming up with a new one had me stumped for a little while, but then I got an idea while we were eating at Panera. My husband and I both love the Chicken Cobb Salad at Panera, and we order it every time we go there. So, why not take the same elements of that salad and make a version of it that you can eat with your hands. Oddly enough, up until last year, I had never tried a Cobb Salad because I didn’t think that I would like it. That’s probably they usually have blue cheese in them. Growing up, my mom always said that blue cheese was yucky, so I just assumed that I wouldn’t like it either. I think that’s a pretty common thing between parents and their kids. Who knows, maybe back then, I wouldn’t have liked it. My tastes have changed, and I am a lot more open now to new flavors. But, I do think that parents should encourage or at least not discourage their kids in trying new things by telling them that they wouldn’t like something before they even try it. These can be a little messy to eat, but like my husband said, “A lot of the best foods are”. You may want to assume Guy Fieri’s “The Hunch” position while you eat them to avoid any clothing disasters. 🙂 Instead of the usual mayo based dressing, this chicken salad is made with a balsamic vinaigrette. In a small bowl, whisk all of the dressing ingredients until well combined. In a medium bowl, add the chicken, eggs and bacon. Add the dressing to the chicken mixture and stir to combine. Add the blue cheese and stir again. 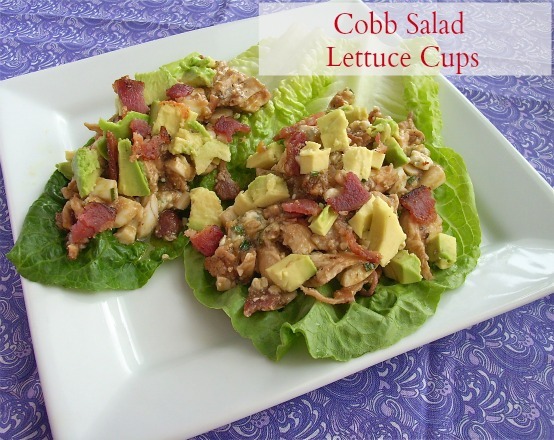 Portion out the chicken mixture onto 4 lettuce cups. 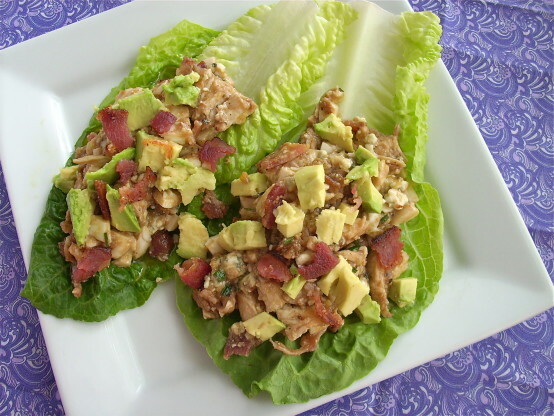 Top with fresh avocado and serve immediately. Depending on how wet you like your chicken salad, you may not want to add all of the dressing. Do you like blue cheese? What’s your favorite kind of salad?